The Seminole people lived in houses called chickees. Seminole chickees were made of wood and plaster, and the roofs were thatched with palmetto fiber. Here are some pictures of chickees like the ones Seminole Indians used. Originally, the Seminoles lived in large villages of chickees arranged around a town square with central buildings in it, like a meeting hall and a sports field. 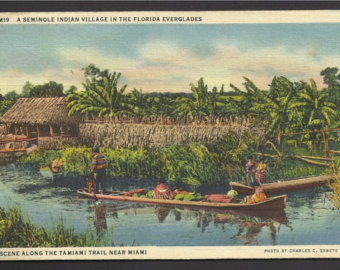 But as the Seminoles moved south, they began living in smaller groups in remote areas of the Everglades. They also began building their houses on wooden stilts that raised the floor two or three feet off the ground. This protected their homes from flooding and swamp animals. Seminole men wore breechcloths. Seminole women wore wraparound skirts, usually woven from palmetto. Shirts were not necessary in Seminole culture, but men and women both wore poncho-style mantles in cool weather. The Seminoles also wore moccasins on their feet. In colonial times, the Seminoles adapted European costume into their own characteristic styles, including turbans and long colorful tunics for men and full patchwork skirts for women. Seminole hunters used bows and arrows. Fishermen usually used fishing spears. Traditionally, Seminole warriors fired their bows or fought with tomahawks. The Seminoles are known for their Native American baskets, woodcarvings, beadwork, and patchwork designs. The Seminole Indians made flat dugout canoes from hollowed-out cypress logs. They steered these boats with poles rather than paddles, and sometimes used sails made from palmetto fiber. Here is a website with pictures of different Native American boat styles. Over land, the Seminoles used dogs as pack animals.